I am delighted to announce that I have successfully completed my very first Daring Bakers Challenge. 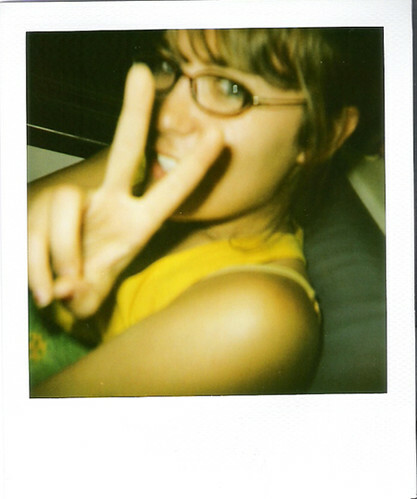 I have been a silent admirer of this great blogging community since I began my blog in December 2007. Baking and I have a long and happy history. I began baking fairly regularly when I was in high school - cakes, biscuits, pastry, bread! My love affair with baking continued well into my University years, when the demands of career and travel left me with little time to boil an egg, let alone bake. Slowly, yet steadily now and with much encouragement from my husband :) I am returning to this great passion - and so I welcome Daring Bakers into my life!! Here's my experience with the very first challenge. A couple of weeks before the challenge was posted, I ran across Dorie Greenspan's book Baking: From My Home to Yours at my local library. Browsing through, I found several recipes I was keen on trying. However, as we were expecting visitors from out of town in March, I knew there would never be enough time to get started. And then I thought I'd better wait for the recipe from the Daring Bakers, and focus on my very first challenge. To my complete and utter delight, Morven chose a recipe from the very same book!! I did bake the cakes the day before I iced them. They stayed well overnight. I put both lemon and orange rind in the batter and as a result got a wonderfully fresh flavour in the cake! 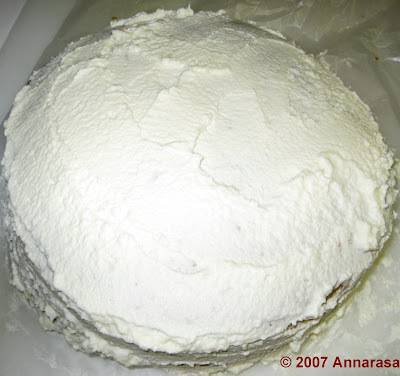 The icing is fresh cream. It turned out delicious, except that I am not so fond of vanilla essence and I doubt that I will use it again to flavour the cream. I filled the cake with home-made cranberry and apple preserve which gave a great tangy taste twist to this otherwise sweet treat. 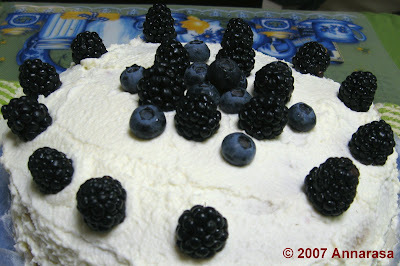 Finally, the blueberries and blackberries on the top were perfect to give both a fresh look and taste to the cake. That looks great! I love the fresh berries on top. The cranberry preserve must've have given it a wonderfully tart flavour. Your cake looks beautiful! Welcome back to the baking fold - I remember when I started baking again, and it is a marvelous feeling. Congratulations on your first challenge!!! your cake looks amazing!! and those blackberries and blueberries on top sure give it a nice look!. I am glad that you've joined the Daring Bakers.. welcome and I hope you enjoy all of our adventures!!! Well done! Congratulations on your first challenge! Welcome to Daring Bakers! Beautiful job on your first challenge!! A lovely cake! Very well done! Your cake looks very fresh and fruity. Glad you dipped your toes into the water of the Daring Baker sea! You won't be able to keep away now. What a pretty cake! I'm glad that your first DB experience was such a positive one! Welcome to Daring Bakers! Your cake looks terrific! Nice job on your first challenge. And welcome to the DB's! I bet your husband is very glad that he got you baking again - YUM! Your cake looks great! 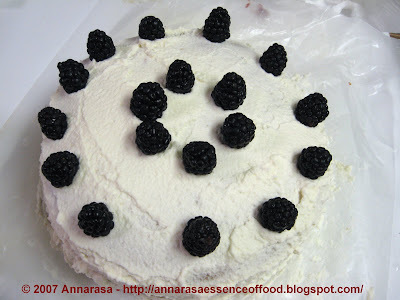 I love the color contrast of the white frosting and dark berries. It's beautiful. This was also my first DB challenge. It was so much fun!! This was my first DB Challenge too! Your cake looks great! Great job, welcome to the group! this is so adorablely gorgeous! just like wanting a slice! This looks delicious, especially the berries on top. I love cakes with fruity flavours. I used blueberry preserves which had tons of whole blueberries so I got a pretty fresh-tasting cake too. 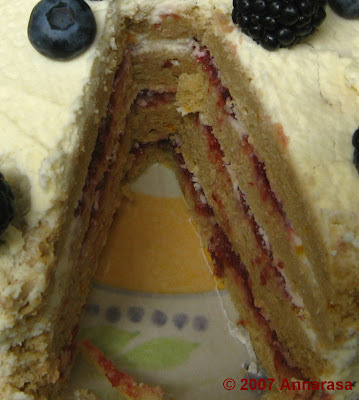 What fun - apple & cranberry preserves inside of a cake! Yum! Great job and welcome to DB! Beautiful cake. I love the berries on top. 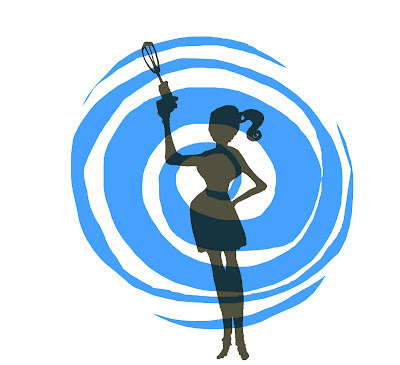 Welcome to Daring Bakers! Congrats, the cake looks awesome!